Tapioca (Manihot esculenta) is a Euphorbiaceous woody shrub native to South America, cultivated extensively as an annual crop in tropical region for its edible starchy tuberous roots. 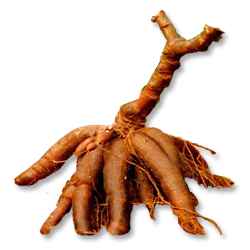 The roots are nutritious and wholesome, and are used as a supplementary food as it is a major source of carbohydrates. The tapioca plant gives the highest yield of food energy per cultivated area per day among crop plants, except possibly for sugarcane. Apart from starch, tapioca roots also contain significant amounts of calcium, phosphorus and vitamin C.
In Kerala, cassava is a secondary staple food and is known as the poor man’s vegetable. Boiled cassava is normally eaten with fish curry (kappayum meenum) or meat, and is a traditional favorite of many Keralites. Kappa biriyani -cassava mixed with meat is a popular dish in central Kerala. Various processed products of export importance are also made from tapioca. Tapioca grows and produces best under warm humid tropical conditions where rainfall is well distributed and fairly abundant. It can also be grown under irrigation where rainfall is low. Its outstanding characteristic in terms of moisture requirements is the ability to withstand fairly prolonged periods of drought. However, at the time of planting there must be sufficient moisture for the plant to establish itself. The crop cannot withstand cold and is killed by frost. The crop grows well in well-drained laterite, gravelly and sandy loam soils. Heavy and rocky soils are less suitable because they restrict root development. The crop cannot survive waterlogged conditions and in such areas, it must be planted on mounds or ridges that permit drainage. The crop can also be gown on hill slopes and on wastelands of low fertility. H-97: This is a semi-branching variety, tolerant to mosaic disease with duration of 10 months. But the harvest can be prolonged even up to 16 months. The starch content is 30%. H-165: This is a non-branching type with poor cooking quality having eight months duration. It is tolerant to mosaic but susceptible to wilt disease. The starch content is 24.5%. H-226: This is a semi-branching type with medium cooking quality having 10 months duration. It is moderately susceptible to mosaic. The starch content is 29%. M-4: This is an erect type with excellent cooking quality having 10 months duration. The starch content is 29%. Sree Visakham: This is a semi-branching type with yellow coloured flesh having 10 months duration. It shows high tolerance to mosaic and low susceptibility to pests like red mites, scale insects, thrips etc. The starch content is 26% and vitamin A 466 IU. Sree Sahya: This is a predominantly semi-branching type with 10 months duration. It shows high tolerance to mosaic and low susceptibility to pests like red mites, scale insects, thrips etc. The starch content is 30%. Sree Prakash: This has seven months duration and the yield potential is 30-40 t/ha. Kalpaka: This is a non-branching type with six months duration and is suited as an intercrop of coconut in reclaimed alluvial soils of Kuttanad. Sree Jaya: This is an early variety with seven months duration and excellent cooking quality. Tuber contains 24-27% starch and is low in cyanogens. Sree Vijaya: This is an early variety with 6-7 months duration and excellent cooking quality. Tuber contains 27-30% starch and is low in cyanogens. Sree Harsha: This has 10 months duration and good cooking quality. Tuber contains 34-36% starch. They are non-bitter and ideal for culinary purposes and the high starch content makes it suitable for preparing dried chips. Nidhi: This is a high yielding early variety with 5.5-6 months duration. It is tolerant to mosaic and moisture stress. Tuber contains 26.8% starch and 20 ppm HCN. Vellayani Hraswa: High yielding early variety with 5-6 months duration. It cannot tolerate drought. The cooking quality is very good. Tubers contain 27.8% starch and 53 ppm cyanogen. Sree Rekha: It is a top cross hybrid with 10 months duration. Tubers contain 28.2% starch with excellent cooking quality. Sree Prabha: It is a top cross hybrid with 10 months duration. Tubers contain 26.8% starch with good cooking quality. Tapioca is propagated by stem cuttings. Select mature healthy stems free from diseases or pests. Discard about 10 cm from the lower mature and about 30 cm from the upper immature end. Stems should be cut into setts of 15-20 cm length using a sharp knife. About 2000 stems are required for planting one hectare. Harvested stems are to be stored vertically in shaded and well-aerated places. Spraying dimethoate (0.05%) on the stem will control scale insects. The main planting seasons are April-May with the onset of southwest monsoon and September-October with the onset of north-east monsoon. Planting can also be done during February-April, provided sufficient moisture is made available through irrigation. For maximum tuber production, April-May planting is preferred because the crop can effectively utilize both the monsoons. The second best season is September-October. For producing minisetts, mature, disease free stems preferably those obtained from indexed meristem culture should be selected. Two node cuttings are taken from these stems using a sharp hack-saw. Top one-third portion is usually discarded in the traditional system, however in the minisett technique, it is fully utilized. The tip of the stem (about 5 to 6 cm long) is carefully cut without causing damage. For preventing dehydration, it is advisable to place the tip cuttings in water. The stem just below the growing tip is very tender with prominent axillary buds. Hence, from this portion, cuttings with four nodes are taken instead of two as the latter may easily get dried up. Select an area with well drained soil and irrigation facility. Shade net house of 35 per cent shade is ideal for the germination and growth of minisetts. Mark out the length and breadth and make raised beds of soil : sand mixture in equal proportion. The beds could be of convenient length and width not exceeding 1 m. An area of 220 m2 nursery is required for producing minisetts for planting one hectare of land. Two node cuttings are planted end to end horizontally, about 5 cm deep inside the soil, with the buds facing either sides. Tip cuttings and four node top setts should be planted erect at 5 cm x 5 cm spacing to prevent decay due to excess moisture in these tender parts. Minisetts would sprout in a week’s time. Mosaic virus infected plants, if any found, should be rogued off as soon as such symptoms are expressed, to keep the nursery disease free. The minisetts will be ready for transplanting in about three to four weeks time. After the basal application of recommended manure in the main field, ridges of 30 cm height are taken with a spacing of 45cm between the ridges and planting is done on the ridges at a spacing of 45 cm. Multiplication ratio by this process is enhanced to 1: 60 as against the traditional method 1:10. Before planting, plough the field 2-3 times or dig to a depth 25-30 cm depending upon soil type to establish a deep porous field in which the setts are to be planted. Pit, flat, ridge or mound method of planting can be adopted depending upon soil type, topography of land and elevation so that waterlogging is avoided. Pit followed by mound is found to be the best method of planting. Plant the cuttings vertically after smoothening the lower cut end, at a depth not exceeding 4-6 cm. Adopt square method of planting at a spacing of 90 x 90 cm @ one cutting per pit. It is preferable to adopt 75 x 75 cm spacing for non-branching varieties like M-4. Gap filling should be done within 15 days after planting preferably with longer setts of 40 cm length. Sree Visakha is a choice variety recommended as an intercrop in coconut gardens. Optimum plant population is 8000 plants per ha with 90 x 90 cm spacing. N and K2O may be applied in three split doses, i.e., 1/3 basal, 1/3 two months after planting and 1/3 three months after planting. Dose of P2O5 can be reduced to half where the crop is grown for more than 3 years under full dose of recommended fertilizers, since under such situation there would be build up of soil P.
For August-September planted tapioca, apply half N, full P2O5 and half K2O basally with first digging and weeding. The remaining quantity of N and K2O may be applied 45 days after planting at the time of intercultivation. Note: N:P2O5:K2O at 50:50:100 kg/ha is recommended for Sree Visakam when grown as an intercrop in coconut garden. Higher levels of N tend to increase HCN content of the tubers. Soil application of Mg as MgSO4 @ 20kg/ha and Zn as ZnSO4 @ 12.5 kg/ha in small channels around the mounds within 2 months of planting cassava providing an interval of 2 weeks between the application of these fertilizers enhance tuber yield and quality. Under conditions of well-distributed rainfall, tapioca grows well as a rainfed crop and irrigation is not necessary. However, the crop has to be irrigated to provide sufficient moisture under conditions of prolonged dry periods after planting. Furrow irrigation and alternate furrow irrigation methods can be adopted to irrigate tapioca. Alternate furrow irrigation once in 20-27 days helps to save water and labour with out affecting yield. When the crop is grown under irrigation, yield increase of 150-200% over the rainfed crop has been observed. Keep the field free of weeds and maintain soil loose by 2-3 shallow diggings or hoeing up to 90 days after planting followed by light earthing up. Retain two shoots on each plant in opposite directions and remove excess shoots about 30 days after planting. Tapioca is planted at a spacing of 90 x 90 cm and it takes about 3-3.5 months time to have enough canopy to cover the land. So it is possible to have an intercrop of groundnut during the early stages of tapioca crop. Bunch varieties like TMV-2, TMV-7, TG-3, TG-14 and Spanish improved are preferred for intercropping in tapioca. The best season for sowing groundnut is May-June. Immediately after planting of tapioca setts, groundnut seeds are sown at a spacing of 30 cm between rows and 20 cm within rows, so that two rows of groundnut can be accommodated in between two rows of cassava. A seed rate of 40-50 kg/ha is recommended for dibbling one seed per hill. Only well-matured and bold seeds are to be selected for sowing. In acid laterite soils of Kerala, apply 1000 kg/ha of lime as basal dressing. A basal dose of 50:100:50 kg N:P2O5:K2O per ha should be given uniformly to both the crops. One month after sowing of the seed, 20 kg each P2O5 and K2O and 10 kg N / ha may be given to the intercrop along with earthing up. Once pod formation has started (i.e., 40-45 days after sowing) the soil should not be disturbed, as it will affect the pod development adversely. The groundnut crop matures in 105 to 110 days. After the harvest of pods, the haulms are incorporated in the soil along with a top dressing of 50 kg each of N and K2O per ha for the main crop. By adopting this practice, 20-25% additional income can be obtained. In sandy areas intercropping tapioca with cowpea / groundnut / black gram / green gram may be recommended giving a spacing of 20 cm on both sides of the ridges. The non-trailing grain cowpea variety V-26 is recommended as a companion crop along with tapioca. For a pure crop of tapioca or for a cropping system involving tapioca as the main crop and the pulse crop suggested above, the field may be irrigated once in 36 days to a depth of 5 cm. This recommendation is for shallow water table situations. For deep water table situations, the crop may be irrigated once in 24 days to a depth of 5 cm. The disease is transmitted by a white fly Bemisia sp. As a rule, only stem cuttings from disease free plants should be used for planting to minimize the spread of the virus disease. For this purpose, tagging of disease free healthy plants for selection as planting materials must be practiced from September to December. All plants showing even very mild symptoms must be rejected. Mosaic tolerant varieties such as H-97 may be used to minimize economic loss of tubers. Setts of 3 to 4 node cuttings from apparently disease free plants are collected and planted in the nursery at a very close spacing of 4 x 4 cm so that about 500 setts can be accommodated in one square metre land. Daily watering of the setts has to be done for the first 10 days and on alternate days afterwards. Screening of CMD symptoms may be started 10 days after planting. Setts showing even mild symptoms are to be removed and burnt. This must be continued up to 20-25 days, by that time healthy seedlings can be transplanted to the main field. Supplementary irrigation may be given in the transplanted field till they get established. Screening for disease symptoms and rouging of infested plants may be continued in field at weekly intervals up to harvest. The selected healthy stems are again cut into minisetts and subjected to nursery and field screening. By adopting this technique it is possible to produce healthy plants. Spray 0.2% zineb or 1% Bordeaux mixture for control of leaf spot. Bacterial blight is a disease noted in severe proportion in certain parts of Kerala. Chemical control is not effective. Use of resistant or tolerant varieties is the only method of control. Among improved varieties, H-97, H-226, H-1687 and H-2304 are tolerant to the disease while H-165 is highly susceptible. Among the local varieties, M-4, Paluvella, Pichivella, Parappilppan, Anamaravan etc. are tolerant to the disease. Red spider mites in the field and scale insects under storage are important pests of tapioca. Under field conditions light infestation of mites can be controlled effectively by spraying the crop with water at 10 days interval from the onset of mite infestation. In the case of very severe infestation, the crop can be protected by spraying 0.05% dimethoate or methyl demeton at monthly intervals from the time of appearance of mites. The stem may be sprayed with 0.05% dimethoate before storing as a prophylactic measure against the scales. To control termites infesting planted setts, sprinkle a little of carbaryl 10% or chlorpyrifos in the mounds prior to planting. Treating chips with granular salt (3%), sun drying thoroughly and storing in gunny bags in godown are very effective against Araecerus fasciculatus and Sitophilus oryzae. Tapioca becomes ready for harvest 9-10 months after planting. Hybrid varieties like H-226, H-97 and H-165, when grown under recommended management practices have recorded yields up to 40-50 t/ha of raw tuber. The local varieties and M-4 yield on an average 12-14 t/ha of tuber.